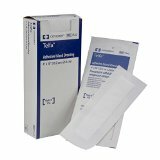 Covidien 7542 Telfa Adhesive I.. Convenient all-in-one dressing Soft, non-woven backing conforms around wound and seals on all four sides, providing protection from the external environment Non-adherent Telfa dressing won't disrupt healing tissue Ideal for lightly draining wounds Made in the USA Telfa Island Dressings are a convenient all-in-one dressing. They have an adhesive border which minimizes the need to add tape or securement. The soft, non-woven backing conforms around a wound and seals on all four sides, providing protection from the external environment. They are an ideal dressing for lightly-draining wounds. Telfa Island Dressings are made in the USA. These bandages are expensive, but necessary if you have had surgery and need a long bandage. So easy to just take off the old and put on the new. As easy as replacing a small bandaid. I was glad to find them on Amazon rather than buying them individually in the store. These dressings are super nice in many ways. They are really easy to put on and controlable. They are the perfect size for post op knee surgery. The telfa is in the middle so it won't stick to the incision, but it also wicks up any drainage. The sticky part forms a border around all 4 sides of the dressing (thus the name, island dressing) and is the part that adheres to the skin. This dressing always stays on, adheres well, but never leaves any sticky adhesive goo behind. It i.. I bought these thinking that the Telfa pads would be 4 inches in width. But, when my Aunt received them, they were approximately 2 inches in width with the tapes taking up close to 2 inches.So, essentially, you end up with a 2 inch wide pad. This is unfortunate since she needed the pads to be at least 3 inches wide. The tape will cause more damage to her bleeding sores.If this was in the description, I would not have bought these. So, for everyone else, please be aware that th..